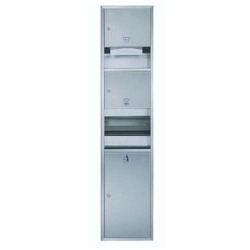 Our range of products include stainless steel washroom 3 in 1 panel and stainless steel washroom panel 2 in 1 panel. We are manufacturing, and supplying premium quality Stainless Steel Washroom 3 In 1 Panel in various specifications. As per international quality standards, the offered accessories are designed with high precision under our adroit professionals' supervision.